Available now at the DMC Store, DVDs and videos of the 2003 World Finals. 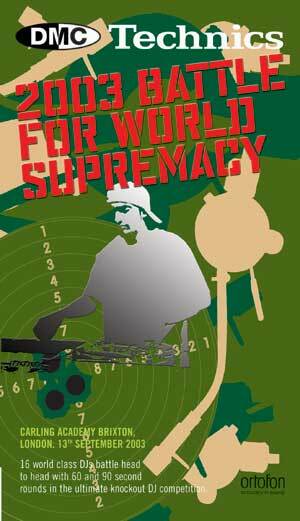 This year, there are DVDs for the teams and supremacy, but video only for the elimination. Note: All Videos are out now, and the World Final DVD will be ready for before Christmas. DMC are waiting for news about the other 2 DVDs. The DMC/Technics World DJ Championship Final. The most open Championship for many years. It sees 12 of the Best DJs in the World battle that eliminated from 19 World DJs in the afternoon, for the vacated World Crown of the Japan's Kentaro. 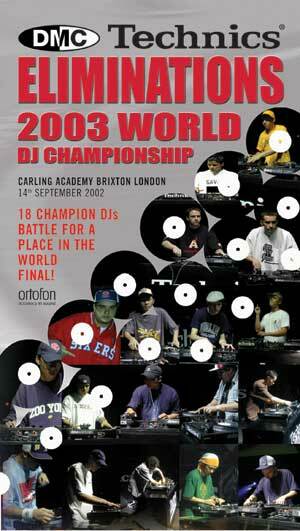 These are the best battle DJs in the World Final with their 6 minutes of 2003 fame. 3) 2003 World Photo's (Picture Slide Show). 5) AAA Backstage: Join Cutmaster Swift before, during & after the main event. The World Team Championship.7 teams using up to six decks and four mixers to battle to become this years World Team Champions and take on the La Guilde (Belgium) defending the 2002 title. 3) 2003 Team Photo's (Picture Slide Show). 4) AAA Backstage: Join Cutmaster Swift before, during & after the main event. The Battle for World Supremacy. 16 World Class DJs battle head to head in 60 second and 90 second rounds in a knockout style to try and take Netik's 2002 crown. * All DVD's will also contain a secret hidden menu with additional bonus material & features! 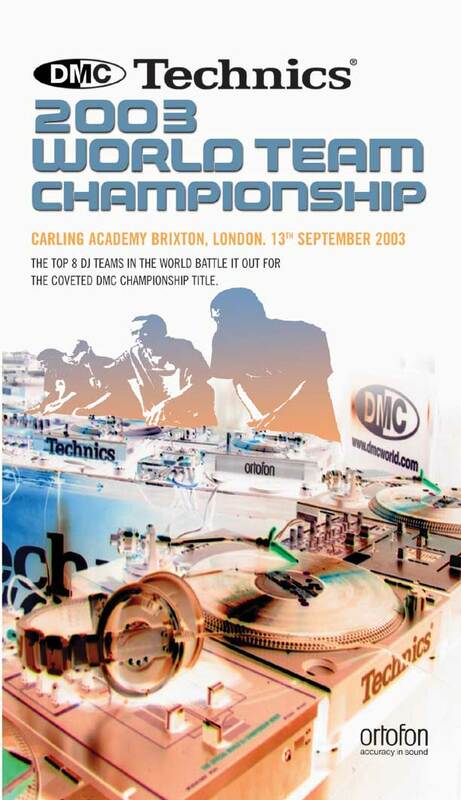 The DMC/Technics World DJ Championship Eliminations. Let the elimination's commence! 19 Countries have gone through the process of finding their Country Champions to compete against each other to become the best in the World. Here are those Champions with their 3 minute elimination set to for a place in the World Final. A final that before it all started was the most open competition in years with Japan's Kentaro declining to defend the 2002 title. its a great site you got, and a super job you do, but thats a shameless plug! i hope you're getting paid for it! Ken - my aim is to provide the fullest information I possibly can on skratchworx. If someone at DMC sees fit to reward me for my DMC exposure then it's a bonus. ive been waiting for another DMC DVD! do you know if HMV will be stocking them? anybody want to scratch w/ me or battle, hit me up on msn "voice chat"
buy the allies allstar beatdown instead!!!!!!!!!!!! Good idea - I think I will!